Well, I was trying to think of something to make you for Easter and this is what I came up with. 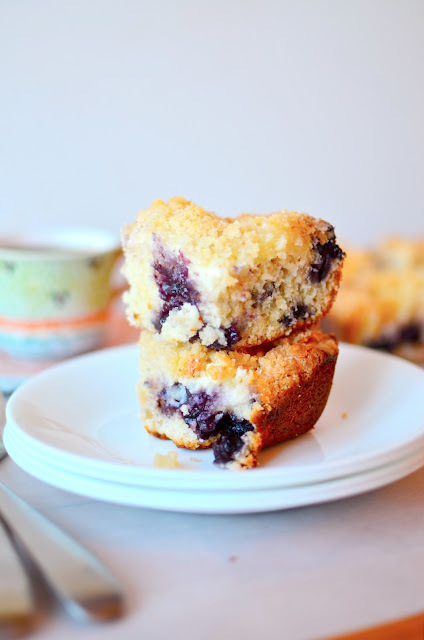 I mean, to me this works as an every(single)day breakfast, but then again, this tender blueberry studded cake with its crispy buttery streusel sinking into a layer of smooth cream cheese might be just a bit too sacred for your everyday life. I know, I'm getting carried away with the usual adjectives again. Somebody should get me a new thesaurus. And how about a few pounds of chocolate too, while you're at it. Chop chop! Anyways, I've been having the biggest brain fart this year trying to plan Easter dinner. I was envisioning something more exciting like lamb chops or a crown roast, but these ideas were quickly stamped out by cries of "Ham and cheesy potatoes, you fiend! It's Easter! ", not to mention Boots's sensible request ("PIZZA!"). Oh well. It was worth a try. But now let's talk about what you are making for Easter. Coffee cake. There are three layers involved here. First you make the cake layer. Easy. Then spread some sweetened cream cheese on top. You'll hardly have time to blink it will all come together so fast. Now just dump on some streusel. And feel really cool about the fact that you can actually spell streusel. Spell check still doesn't believe me, but don't worry, I looked it up on Google, so it's all good. After a little sojourn in the oven, your cake will be fluffy and your streusel will be golden and crispy. The cream cheese and streusel kind of work together to make one creamy, crunchy layer. Pretty neat. This probably keeps best in the fridge (at least it did for us), but I doubt you'll have leftovers. Preheat oven to 350ºF and liberally grease an 8x8 inch pan (or line with parchment for easier removal). Beat together the butter and sugar until smooth. Add the egg and beat for another minute. Add the sour cream and vanilla and mix well. Mix together the flour, baking powder, and salt and mix into the rest just until blended. Fold in the berries. Spread into prepared dish. Mix together the cream cheese and powdered sugar until smooth (make sure the cream cheese is completely softened or it will be hard to spread). Spread over the blueberry layer. Mix together the streusel ingredients until crumbly and sprinkle over the top. Bake for about 55 minutes or until the top is crispy.